Nerf guns can be a lot of fun for kids to run around and play together with. It’s an incredibly exciting group play experience that can strengthen your child’s social skills and teamwork abilities. However, there are so many different options available that it can be tricky. 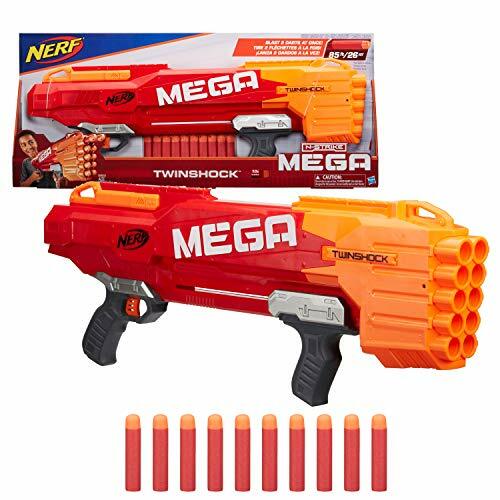 If you were struggling to find the best Mega Nerf guns, you’ll be pleased to hear that you’re in the right place. We’ve researched and reviewed what the best N-Strike Mega Nerf guns have to offer so that you can simply read through the review below and pick the one that your little one would enjoy the most. We were impressed with how kids can extend this Mega Toy Blaster to up to 1 meter in length to get more range. They can then fold it back in for closer combat which makes it great for being used in a range of playing scenarios. Adjusting the length it super easy by simply sliding the barrel to make it longer and retracting it when you need to make it shorter. It comes with 10 AccuStrike Mega darts that provide your little one with plenty of ammunition. The Mega darts that are provided with this one have all been tried and tested. Therefore, you can be sure that they’re of a high-quality to ensure that they perform well. They have hollow tips and the body has been made with soft foam materials. Kids have been loving how they can adjust the length of this one to play at longer and shorter ranges. 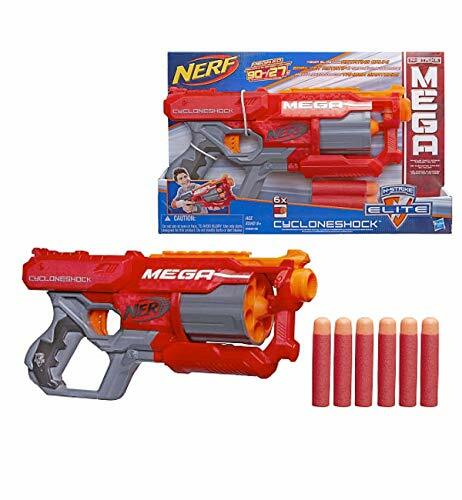 This Elite Mega CycloneShock allows kids to load it up with 6 darts and fire them at an incredibly rapid pace. Therefore, it’s best for the faster pace playing situations. The reason as to why this one can shoot to fast is because of the rotating drum feature. Your little one can shoot out 6 darts, one after another, without having to reload! We also liked how the darts are Mega Whistler ones which allows them to be shot at up to 90 feet. They also make a screaming noise while the whiz through the air, which can be a lot of fun. All of the materials used to construct this blaster and the darts are of a high-quality and safe for kids. If your child wants something that they can use to shoot as a fast pace without having to reload, this CycloneShock Blaster would be a fantastic option. Children have been having an absolute blast with this one because of how they are able to shoot 2 darts at the same time! In fact, this Neft N-Strike Mega TwinShock comes with 3 different shooting features. You can either shoot 1 dart, 2 darts at the same time, or use the slam fire effect that shoots even more darts out. The darts are able to fire at a range of up to 85 feet. However, this one is best for close quarters play. We liked how it comes with a total of 10 darts. This provides children with plenty of ammunition to have fun with for hours. The instructions that are available are also easy to understand. With so many different shooting options available, your little one will have a ton of fun using this blaster to play for hours on end. 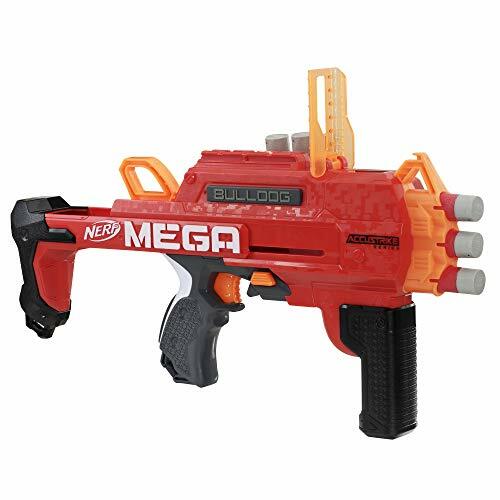 The Centurion Mega Toy Blaster measures in at 1 meter long which provides kid wit the ability to shoot at longer ranges. Kids can use it to shoot people that are up to 30 meters away! 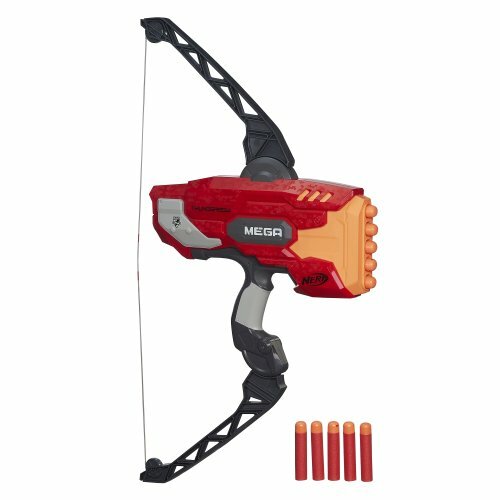 It comes with 6 Nerf Mega darts that allow kids to shoot with a lot of power. We also liked how there’s a folding bipod available that lets kids stabilize their shots. This can be easily folded and pulled out quickly during the times where your little one wants to use it. The darts that are included have been made using high-quality foam materials that are flexible, as well as a hollow tip. They have been tried and tested to ensure that they work effectively and are safe. We liked how kids are able to use this blaster to shoot people from longer distances due to how it’s longer. Kids are provided with 3 darts, a blaster, and a set of easy to follow instructions which lets them get the toy ready to use in not time. 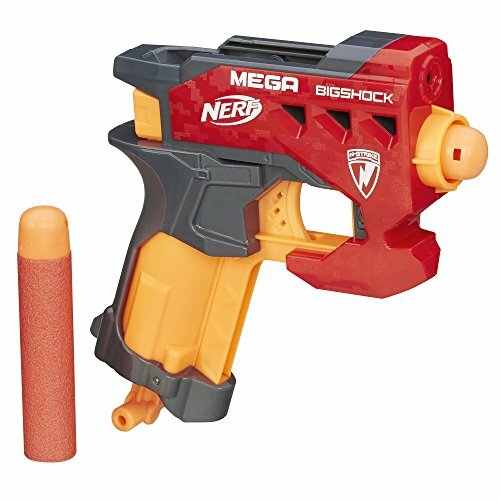 The Tri-Break blaster that was available means that kids can hold up to 3 of the Mega Whistler darts that are available. These Whistler Darts are awesome as they allow kids to shoot them and listen to the sound that they make as they soar through the air. This is a great option that children love using during close quarter games. The loading feature lets kids reload their toy to start shooting within no time. They’ve also been having fun due to the noise that the Whistler darts make when they shoot them. Children have been having a blast with this one due to how they can switch between the different modes fast. All they have to do is swing the grip downwards which extends the stock and makes the sight flip up. They can then swing the grip upwards to bring the stock back in and get the sight to flip downwards. This is a fun feature that children have fun using while they’re in the middle of shooting with other kids. It comes with 6 AccuStrike Nerf Mega darts as well. These have been designed to allow kids to shoot with accuracy. They can also store up to an additional 3 darts on the blaster. We liked how this one lets kids change between the different shooting modes with ease. Moreover, the darts that have been included are incredibly accurate. 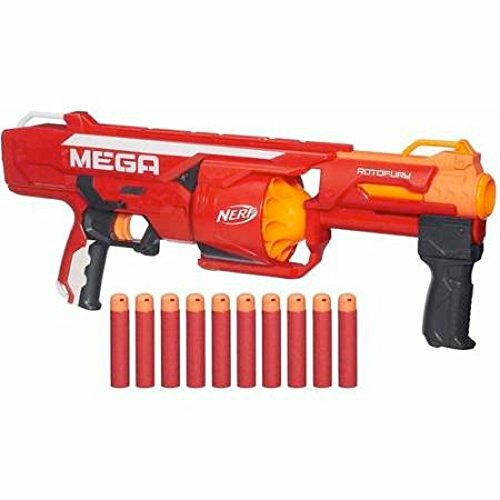 The Nerf N-Strike Mega Sereis RotoFury Blaster comes with a total of 10 Mega Whistler darts which is plenty for kids to play with. They also have fun with the noise that the darts make while being shot. We were also impressed with how the drum that’s available in this blaster allows kids to shoot the darts one after another without having to reload. This makes for some fun playing experiences that lets kids be faster. They can also shoot these darts to reach a maximum distance of up to 90 feet. Therefore, your little one can have a blast keeping their distance and getting longer range shots. This is a great option that lets kids fire 10 darts one after another without having to reload. They can also be up to 90 feet away from their target. 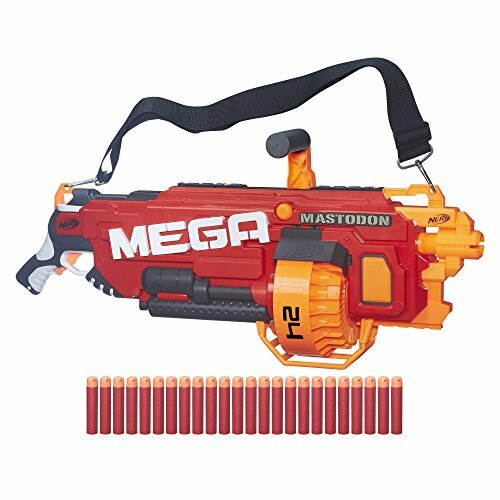 This Mega BigShock Blaster comes with 2 Mega darts and a dart storage unit available with the blaster. This lets kids easily reload with speed to keep on top of their opponents. We also liked how this blaster has been made to be smaller. As a result, younger children have an easier time holding it. This can also make it a better option for kids to use while running around in smaller spaces. In addition to this, the darts have a whistle sound effect that kids have an absolute blast with. They make the playing experience even more exciting! We found this one to be a great choice for younger children as they can hold the blaster easily in their hands. This can also make it more suitable for playing in smaller spaces while running around. We were impressed with how this Mega Mastodon has a motorized feature as it provides kids with a lot of power to have fun with. They can load it with up to 24 darts in the rotating drum. This means that they don’t have to keep on reloading and are able to shoot at a faster pace. The darts can also reach a maximum distance of up to 30 meters which makes it a fantastic option for long range shooting. The darts that are included also have a whistling sound effect. This makes it a lot of fun for kids to run around and play with. With space for 24 darts in the rotating drum, kids are able to shoot them at an incredibly fast pace without having to reload. 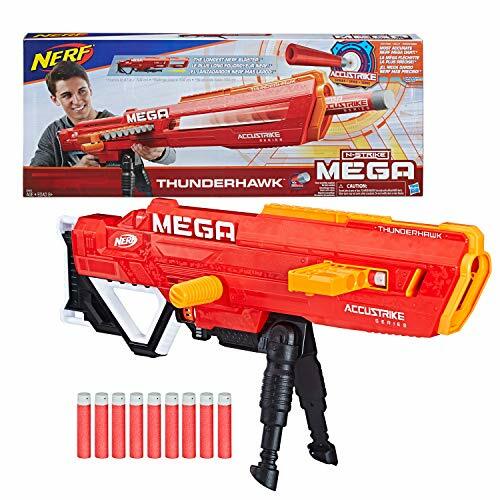 Children have been having a lot of fun using this Nerf gun because it comes with a pump-action feature. This is super exciting to use as it’s a unique reloading feature that lets them fire one dart at a time. The darts can reach a maximum distance of 90 feet, which is pretty impressive. This set also comes with 6 Mega Whistler darts which lets children shoot them and listen to the sound that it makes. The instructions that are included are also easy to understand. As a result, you can be sure to have this blaster ready to use in no time. The pump-action feature is incredibly fun for kids to use and it lets them shot one dart at a time at an impressive range. 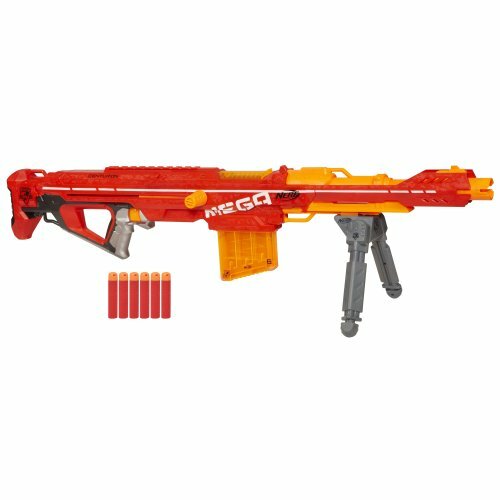 The ThunderBow Blaster is an awesome option for kids who want to have a more unique option compared to the standard blasters. We were impressed with how it has a realistic bow action with bow arms that flex. There are 10 Mega darts included which can be shot one after another without your little one needing to reload it. Therefore, it’s a great choice for close quarters situations where your child needs to respond fast. These darts can also be shot out at up to 100 feet. Kids have been liking how they make a whistling noise while soaring through the air too as it makes the playing experience more exciting. The realistic bow action feature available with this one provides kids with a unique playing experience that they’ve been having an absolute blast with. With a capacity of 3 darts, you can be sure that your little one will be able to run around and have enough ammo while playing in smaller groups. We were impressed with how powerful this blaster is and how kids can shoot the darts to reach a distance of 85 feet. Furthermore, they’ve used whistler darts which make an exciting noise as they fly through the air. Not to mention, there’s a loading clip available that lets kids reload the darts using just one hand! Parents have also been glad to find that the materials used to construct this toy and the darts of a high standard. This ensures that it’s durable and safe for your little one to play with for years to come. The power that’s available with this blaster ensures that kids can pull off shots with accuracy and speed! 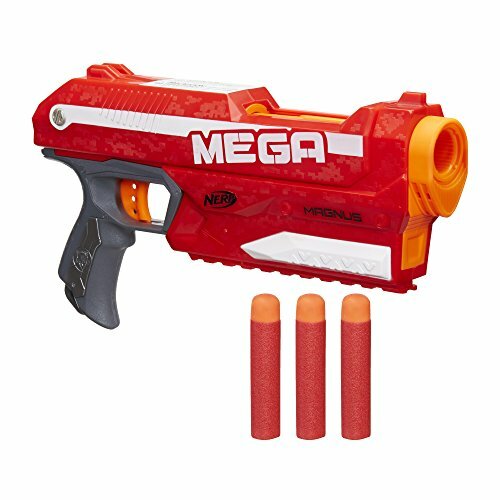 So, those were some among some of the top Nerf Mega guns that are currently available. You can now start to narrow down your search and focus on the ones that you think your little one will enjoy playing with the most. However, if you still aren’t feeling 100% certain or you still have some queries, don’t worry. We’ve created this buyers guide section to provide you with additional information to help you out. 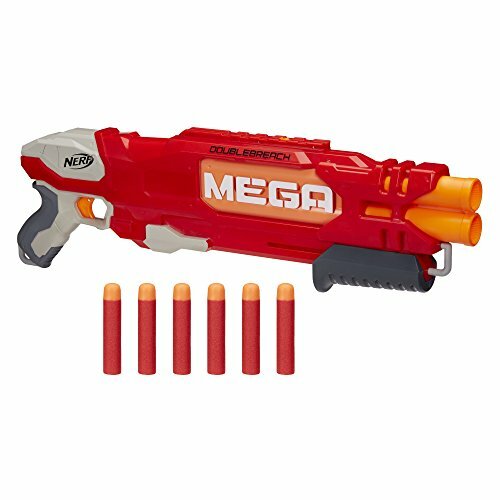 While reading through the different kinds of Mega Nerf guns that are on offer, you may have realized that they require different darts. It’s likely that at some point or another, your kids are going to need new darts to continue playing. In which case, it’s important to make sure that you’ve purchased the right ones. This is because some of the Mega guns only take specific darts. Furthermore, you don’t always get a wide selection of darts available with the toy guns. Therefore, you may have to consider stretching your budget a little more to buy extra darts. 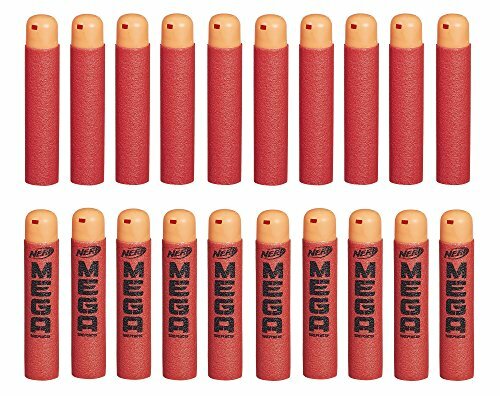 For some of the best replacement mega darts consider the ones below, just be sure their compatible with the blaster your child has. When it comes to these Mega dart Nerf guns, you may be feeling a little apprehensive about how safe they are. Well, these toys have specifically been made for children, which means that the company has taken into account how safe all the components need to be for kids. The darts that children shoot have hollow tips which means that if they get hit, there are no sharp edges that could be painful. They have used foam materials to make the rest of the dart soft and safe for children. Furthermore, the power behind these toys has been made to be appropriate for kids. Be sure to look at the recommended age for each of the toys before committing to a purchase. This is because the toys have been specifically made to be safe and appropriate for those age ranges. Prior to making a final decision, it’s important to gauge a good idea of your child’s favorite playing style. Do they prefer to be in close proximity to their targets, or much further away? Considering these playing styles will have a big impact on which toy you choose from this review. If they like to play in smaller spaces that keeps them close to their opponents, finding a blaster with a rapid fire rate and smaller size would be best. When it comes to kids who like to have the best of the short range and long distance playing style, the toys that can be extended would be excellent choices. This is because kids can use them at a normal size when closer, and expand it out to be larger when they want to be further away. Lastly, children who have the most fun playing from a long distance would be better off with the options that come with scopes and a longer size. This is because these ones allow your little one to be more accurate and further away. That wraps up our review on what the best Mega Nerf guns have to offer. Make sure that you read through all the main features, pros, cons, age recommendation, and what makes each one stand out. The buyers guide section also includes additional information that can prove useful. 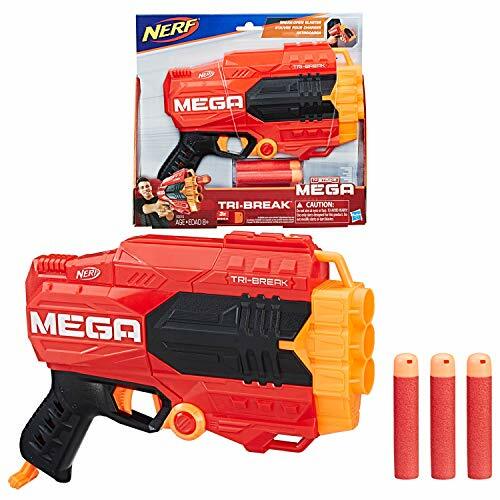 We hope that you can use this review to find the best Nerf Mega toy for your son or daughter to have fun playing with for years!